Text written by by Cara Stone, Instruction Librarian. 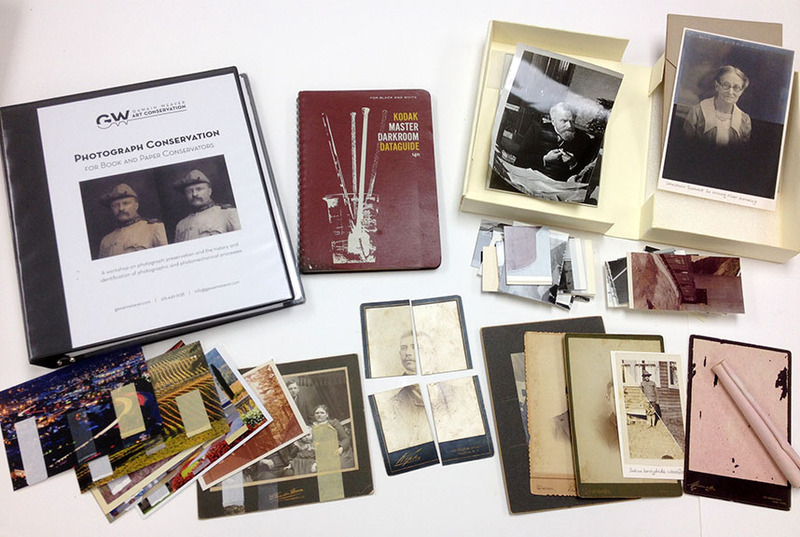 Photo captions by Sonya Barron, Collections Conservator. Susan Vega Garcia talking to the students in the beginning of the workshop. Susan shared about books in the library that were written by Latinx writers and poets, who have a connection to Iowa. 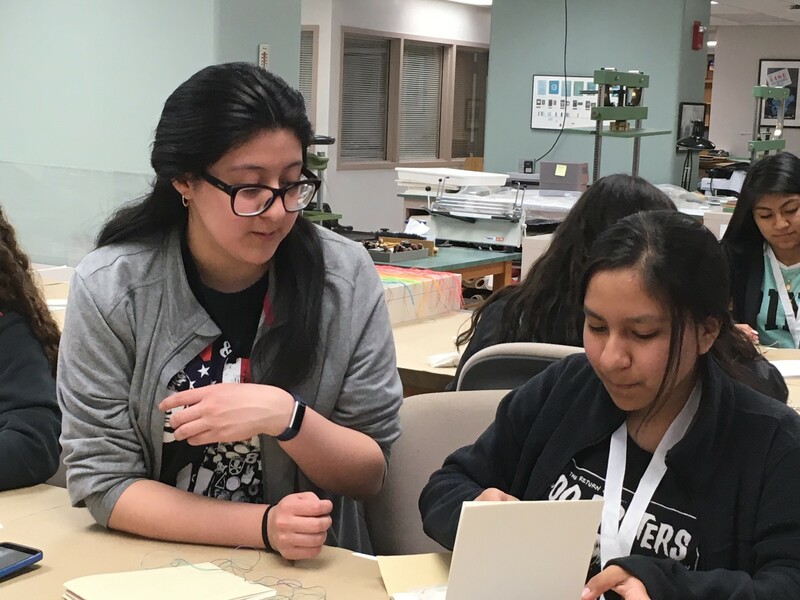 Library staff had the pleasure of welcoming 4-H students from around the state to ISU for the 2018 4-H Maize Retreat on April 13th. 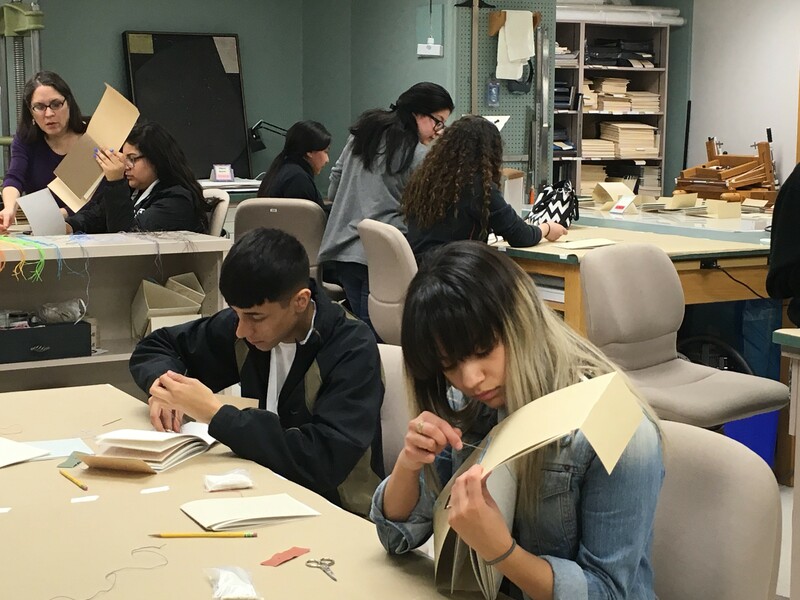 In their time at the University Library, students participated in three different workshops focused on “Telling Your Story.” They worked with Sonya Barron and Susan A. Vega García to learn about preservation and sew their own memory books. Susan Vega-Garcia offering tips on getting the needle to go into the right sewing hole. 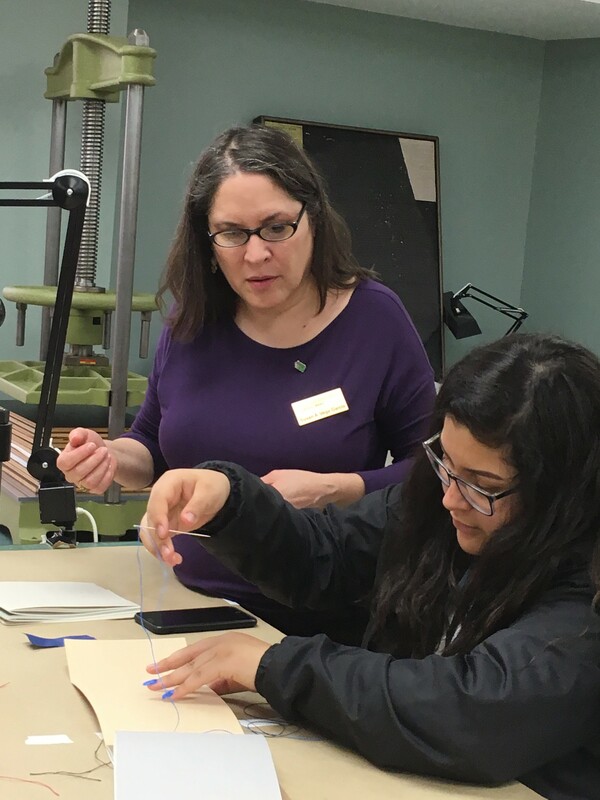 Ana Moreno, student assistant with the Special Collections/University Archives Department, helps an 8th grade student figure out the sewing pattern. Rosie Rowe and Harrison W. Inefuku led a workshop where students crafted a story that was meaningful to them and recorded it as an audio snapshot. Rachel Seale and Cara B. 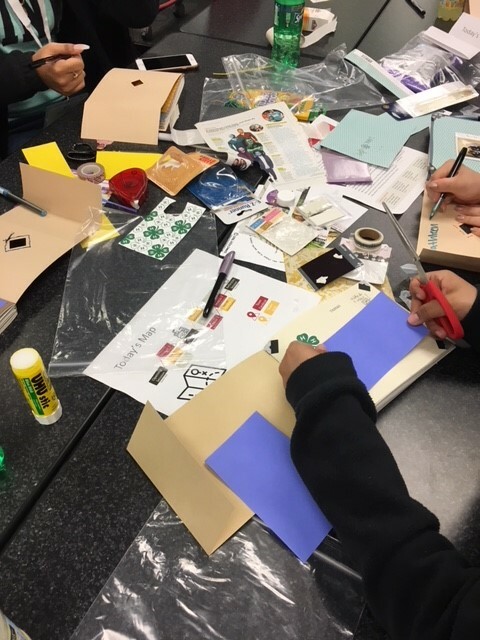 Stone focused on visual storytelling in their workshop where students combined pictures, stickers, decorative tape, images from magazines, and polaroid photos to add to their memory book. The students created the first scrapbook page in their newly constructed memory books. Many of them made their page about the experience they had in the library workshops and the new friends they made. It was so rewarding to see these students come together from all over Iowa (Marshalltown, Tipton, Muscatine, Des Moines, and Boone, to name a few) and develop new friendships, face challenges (the consensus was that sewing is hard, but the outcomes from the sewing were cool), and gain confidence in sharing their voice and being on a college campus. 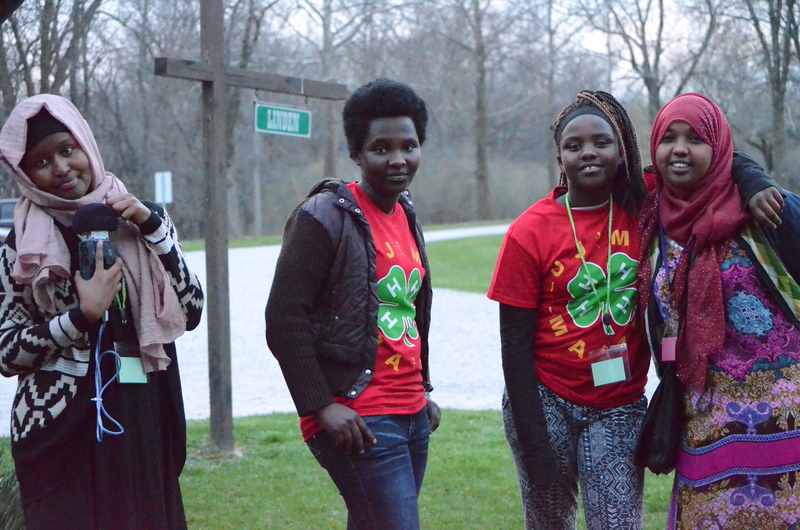 After their day at the library, the students spent to rest of their weekend at the Clover Woods Camping Center to continue celebrating Latino and Native American heritage, growing as young leaders. 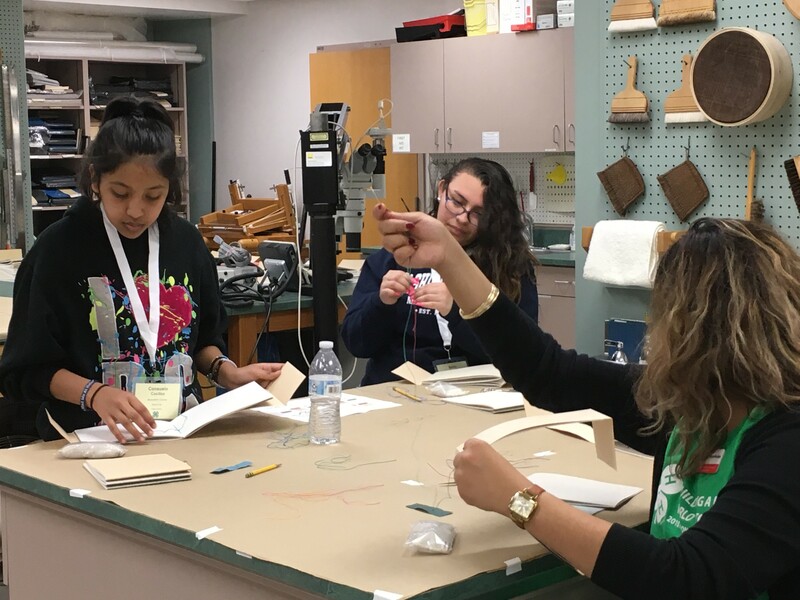 In September, the Preservation Lab participated in a day-long workshop for 4-H youth in grades 8-12 from minority communities across Iowa. The day that the kids spent at the ISU library was a part of a 3 day retreat called Ujima and AAPI (Asian American Pacific Islander). The kids who come to these retreats are African, African American and Asian American. The event was developed by the Culturally Based Youth Leadership Accelerator Program (CYLA). 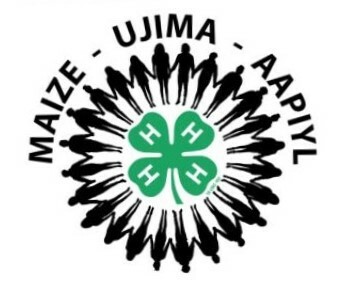 The purpose of the initiative is to encourage underrepresented and underserved youth to become part of their local 4-H learning communities, drawing upon their cultural strengths, knowledge and narratives. The library partnered with ISU’s Extension and Outreach in order to be able to reach this audience of 4-H students. The partnership has been of great benefit to the library because the university’s 4-H program provides the infrastructure that is necessary to be able to bring dozens of kids from communities across Iowa to the university campus. They stay at the Clover Woods camp center outside of town, where the majority of their activities take place. 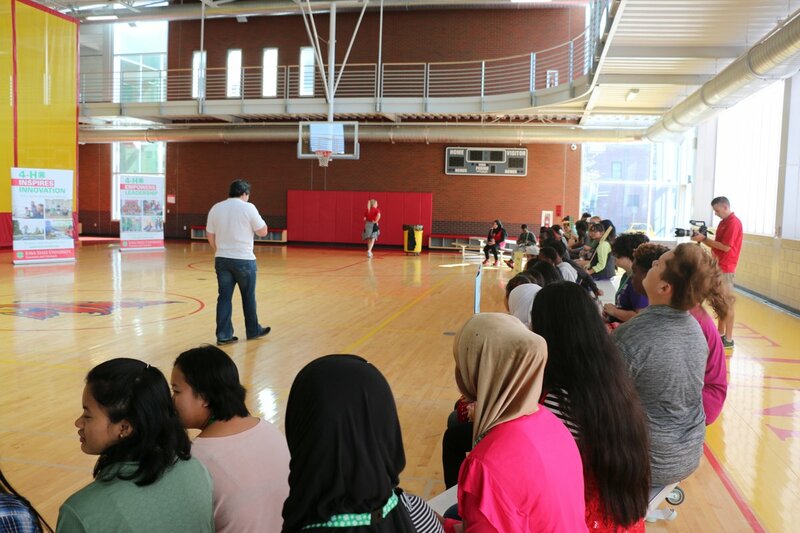 The youth spend the first day of the retreat on the ISU campus, participating in workshops that are offered by different university departments. This year the library was one of the sites that they could pick from. ISU’s Extension and Outreach 4-H Office took care of all the complicated logistics, all we had to do was prepare awesome, memorable workshops and be ready for a day full of exciting high energy interaction with our audience. Co-teaching one of the groups at the Preservation lab. Sonya Barron and Emilie Duncan, our Lennox Preservation Intern. During their day at the library the students participated in 3 different workshops. And yes, we definitely provided plentiful lunch and snacks! 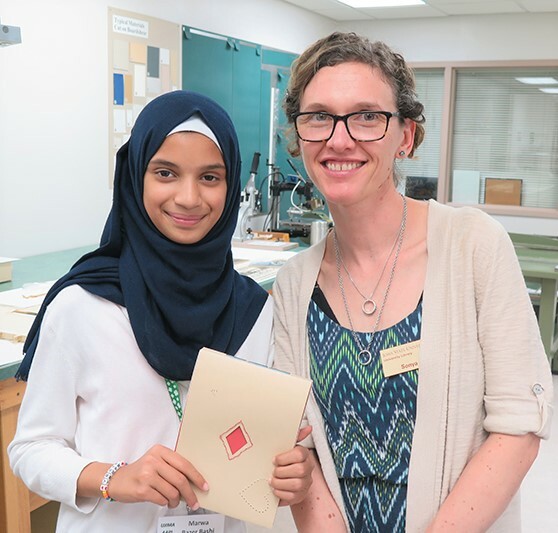 Three departments within the Curation Services division created hands-on teaching sessions united by one theme: Telling Your Story. The inspiration for the theme came from observing and acknowledging that minority individuals are extremely underrepresented in professions engaged with cultural heritage. Most often, minority communities have their stories told by people who are not a part of that community and may not understand their experiences or have a similar perspective on their history. In our workshops we wanted to champion the idea that the students had a part to play in telling their story and the stories of their family and community. Our AV Preservation Specialist, Rosie Rowe, taught the students how to record each other’s voices on an iPad app, StoryCorps-style. Most of the kids were willing to share a story about themselves and their families. In some cases English language skills presented a barrier. Most of the young people in this group had spent a significant amount of time in refugee camps and had been through difficult traumatic events. Their stories were powerful. At the end the day the students got to take their recorded story home on a USB jump drive. Practicing detective skills: looking at original documents from special collections. At Special Collections and University Archives they worked on piecing together a real life story by examining original documents from the library’s rare collections. Each person in the group only had information about one part of the story. How these fragments fit together was revealed only at the end of the session, when everyone shared what they discovered. 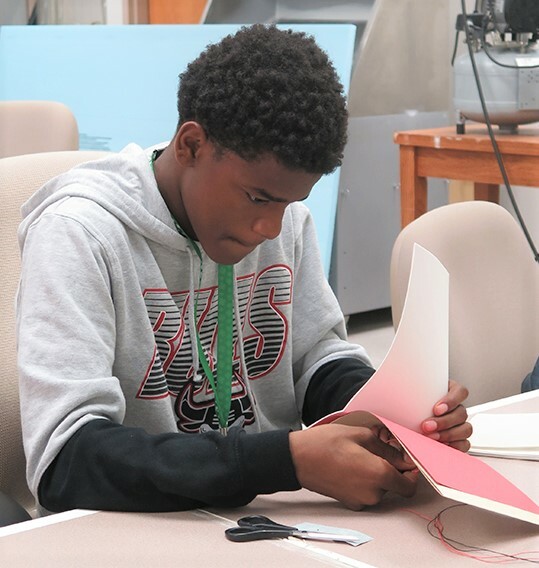 At the Preservation lab the participants got to try their hand at making their very own memory book/scrapbook. They selected colors of thread to sew a simple non-adhesive structure using attractive archival-quality materials. For all of them, this was the first time they had made a book. Although there was some frustration involved, there was a lot more enjoyment and pride of accomplishment. This student said that he surprised himself. He didn’t know he could make a book. I think that exploring the behind-the-scenes parts of the library was eye-opening for many of the youth. The conventional image of a librarian is a person sitting at a desk with a computer, helping people find books. The students were surprised that librarians could also be teachers, history detectives, recorders of others’ voices and could work with old books and historical documents. I got a glimpse into the depth of experience that the students possessed because they were willing to share their stories. I felt lucky to be there and was filled with respect for them. Phew, teaching is hard! I take my hat off to all good teachers out there. We really need to show our children’s teachers that we value their work. How about a bigger salary to start with? 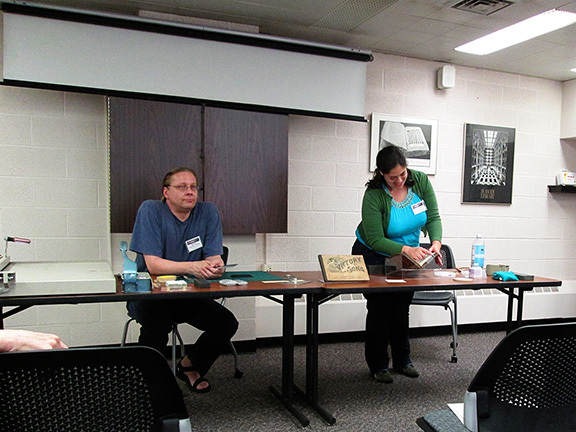 A few weeks ago I co-taught a workshop at MAC, Midwest Archives Conference in Omaha, NE. I worked together with two lovely colleagues from the University of Kansas – Conservator of Special Collections Angela Andres and Assistant Conservator Roberta Woodrick. The workshop was called Exhibit Support Basics: Solutions for Small Institutions and Small Budgets. Our group of 9 participants included librarians, archivists and one registrar. They came from institutions ranging from the Midwest Archaeological Center in Lincoln, Nebraska to Minnesota State University Library. During the workshop we presented demos of 2 variations on an exhibit support for a flat item and one model of a book cradle. Both were made from mat board. The participants fearlessly forged on, showing confidence with blades and rulers. All of them said that they had never used bone folders and scalpels before! Several of the ladies remarked on how good it felt to work with their hands and how satisfying it was to be able to complete a finite project. 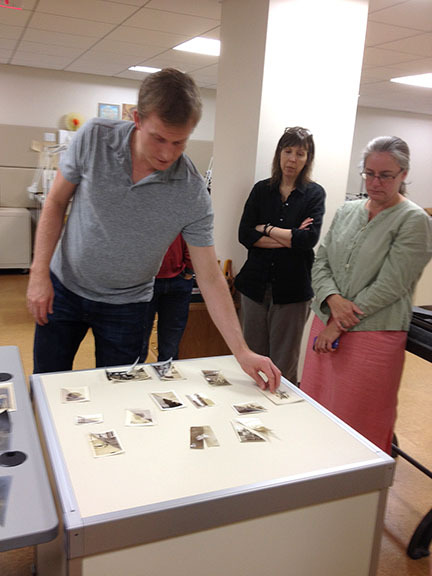 Thanks to generous support from ISU Library’s staff development funds, I recently attended Gawain Weaver and Jennifer Olsen’s Photograph Conservation Workshop for Book and Paper Conservators, hosted by Head of Conservation Beth Doyle and her team at the Duke University Libraries Conservation Department. Duke University proved to be a wonderful workshop location, boasting a spacious conservation lab, beautifully landscaped campus, sunny weather (after that first day of rainstorms! ), and lots of great eateries. 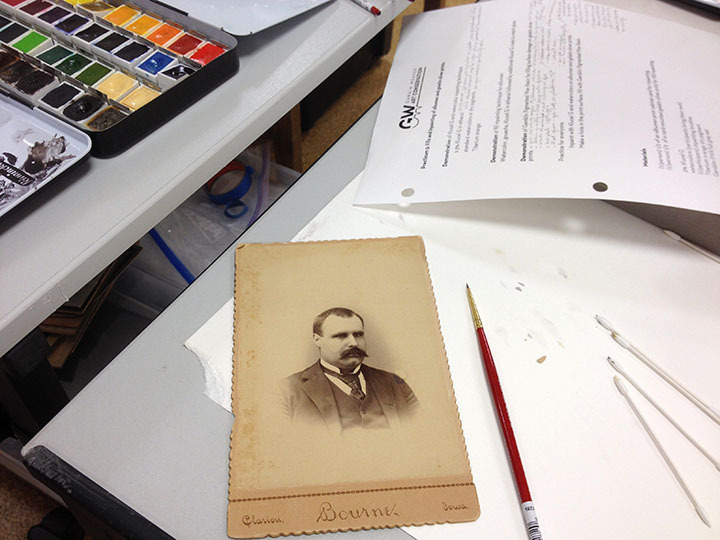 A few years ago, ISU Library hosted one of Gawain Weaver’s excellent Care and Identification of Photographs Workshops, so my expectations were pretty high for this week of study. Gawain and Jennifer did not disappoint: they came armed with an impressive arsenal of photographic materials for us to experiment on, as well as tools, specialized equipment, chemicals, and resource materials. I appreciated their balanced approach, which included some instruction in the history of photography, the chemistry of photographic print processes and their deterioration, broad trends in the fine art photography market, the ethics of treating photographic materials, and — of course — plenty of hands-on treatment activities. Jennifer Olsen demonstrates filling and inpainting techniques on an albumen print. Our group of twelve workshop participants hailed from all over the U.S., and represented institutional labs, regional conservation centers, and private practices. 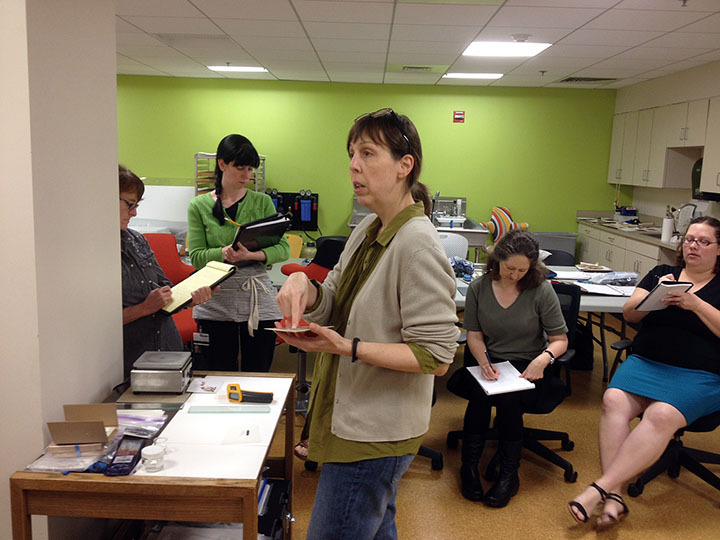 The workshop targets “mid-career” book and paper conservators, and assumes a solid knowledge base in paper conservation techniques. 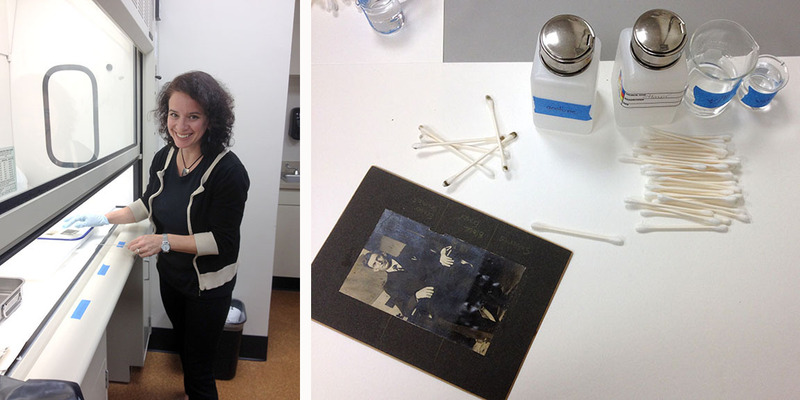 Clara Ines Rojas Sebesta monitors photographs in a solvent bath under the fume hood (left). Testing methods for removing silver mirroring, including solvent-dampened swabs (right). Our hands-on instruction included some controversial “don’t try this at home” demos to impress upon us the irreversible and extreme repercussions of some types of chemical treatments, followed by dry and wet cleaning methods, silver mirroring removal techniques, separation of photographs stuck to glass, and tape removal. We also learned to mount and unmount photographs with various types of drymount and various mechanical, heat-based, and solvent-based techniques. We practiced resin fills on albumen prints, and inpainted with watercolors. Throughout it all, Gawain and Jennifer were on hand to discuss our questions and concerns, encourage us, and share stories of their real-life photograph conservation successes and challenges. (Left to right:) Gawain Weaver, Jennifer Olsen, and Beth Doyle. Four days, thirty-plus pages of lecture notes, and countless hours of hands-on practice later, I will certainly not be putting any photograph conservators out of business. On the contrary, I believe my fellow participants and I all left with a healthy respect for the risks and challenges particular to photograph conservation. Even so, I’m grateful to have spent the week in the company of talented and generous colleagues, and to have acquired some new skills and resources to help me more judiciously care for the photographs in our collections at ISU Library. Inpainting resin fills on albumen prints. Visit Preservation Underground to read Beth Doyle’s summary of the workshop from the perspective of the host institution. The above letters (SOS ICPC) may not mean much to most people, but for those in the Iowa library world of preservation and conservation, they mean an opportunity to listen, learn, tour, and mingle with other library colleagues. The 2014 SOS ICPC (the annual “Save Our Stuff” conference of the Iowa Conservation & Preservation Consortium) was held at the University of Iowa’s Main Library on June 6th. A couple of the topics and workshops piqued my interest, so I decided to attend this year along with my ISU Library colleagues, Hilary Seo, Head of Preservation, and Whitney Olthoff, Project Archivist. Thinking Inside the Box with Kären Mason and Janet Weaver. The Keynote Speaker was John Doershuk, State Archaeologist and Director, Office of the State Archaeologist, who discussed recent archaeological finds on the University of Iowa campus. The University of Iowa is still making adjustments to their campus after major flooding in June 2008 and recently unearthed beads, glassware, and other artifacts of interest. They are planning upcoming future digs as well. Thinking Inside the Box with Kären Mason (far right image, center) and Janet Weaver (far right image, left). 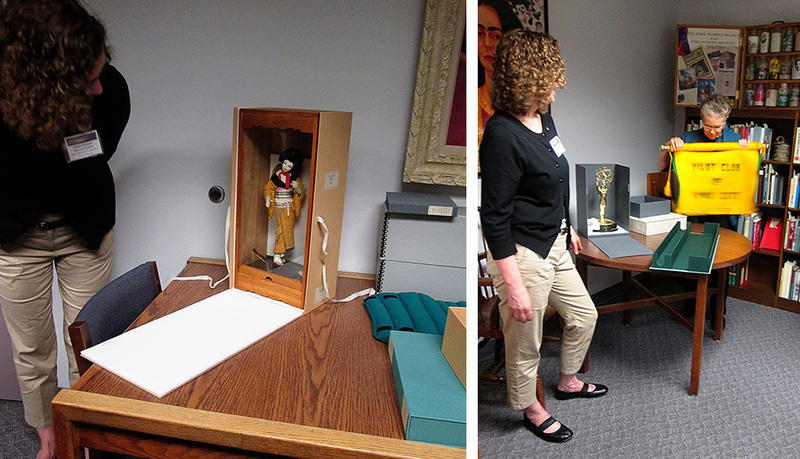 Afterwards I went to the Iowa Women’s Archives for Thinking Inside the Box with Kären Mason, Curator, and Janet Weaver, Assistant Curator. They had several interesting items to look at for housing ideas, but I was really interested in the boxing of those special items crafted by the University of Iowa’s Conservation Lab and the interesting ways their boxes accommodated them. Kären sounded very happy to have a great team working in the Conservation Lab to come up with and construct some creative boxing ideas. Taxidermy Care & Cleaning with Cindy Opitz. 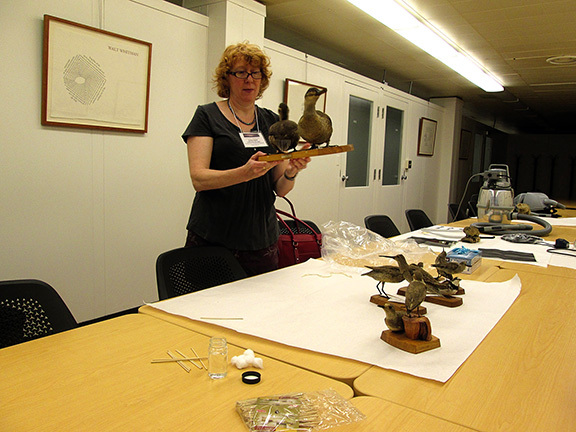 Next I headed to the Special Collections Classroom for Taxidermy Care & Cleaning by Cindy Opitz, Collections Manager, UI Museum of Natural History. Cindy explained how to be cost efficient and make your own Q-tips as you can go through so many of them when cleaning exhibits. She demonstrated the proper cleaning and low speed vacuuming techniques using brushes and screens. It was amazing how much dirt came off of our bird specimens with our Q-tips. 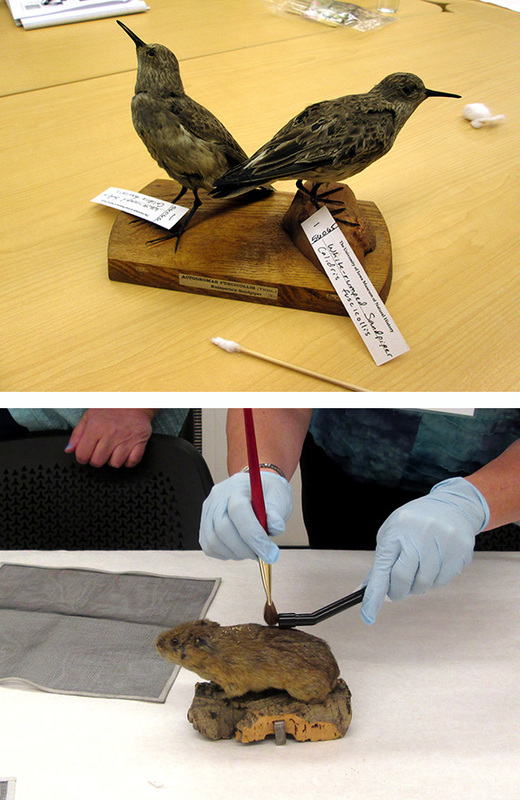 Taxidermy Care & Cleaning by Cindy Opitz. The birds at top are the piece I worked on. Lastly I attended Making Custom Exhibition Supports by Bill Voss, Conservation Technician, and Brenna Campbell, Assistant Conservator, UI Libraries. Bill demonstrated making custom mounts using his bare hands using Vivak (an alternative to thin Plexiglas), and Brenna showed us the uses of polyethylene strapping and J-Lar tape in securely holding book pages open for exhibit. Making Custom Exhibition Supports with Bill Voss and Brenna Campbell. I came away with many new ideas on boxing techniques, custom exhibit supports, and cleaning taxidermy if the need be. ISU Library’s new Cataloging and Metadata Management Librarian, Kelly, tries her hand at paper marbling. 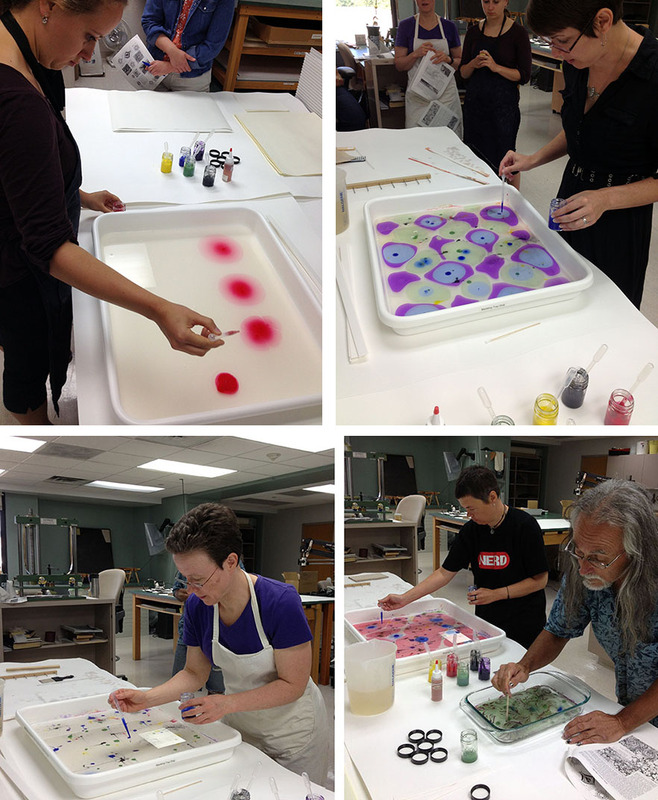 Using materials from Hollander’s Complete Marbling Kit and Galen Berry’s The Art of Marbling on Paper and Fabric as a reference guide, the Preservation Department recently held a voluntary staff development day exploring paper marbling. The Conservation Unit staff, our volunteer Martha, and our Lennox Intern, Susanna, were joined by Jim from the Preservation Services Unit and Lori from the Digital Initiatives Unit. We had one participant from outside the Preservation Department, the new Cataloging and Metadata Management Librarian, Kelly. Why invite someone to coffee when you can invite her to get to know your department over a paper marbling tray instead? Susanna, our Lennox Intern, and I prepared the paper to be marbled the day before the workshop. The marbling kit came with a stack of small, 7″ x 10″ sheets of paper, but we also cut down some 17″ x 22″ sheets (the largest size that would fit comfortably in the marbling tray) of toothy, white endsheet stock and cream-colored Permalife. We sponged an alum solution onto one side of the sheets of paper, marking the non-alum-treated side with a small pencil mark to distinguish it later. 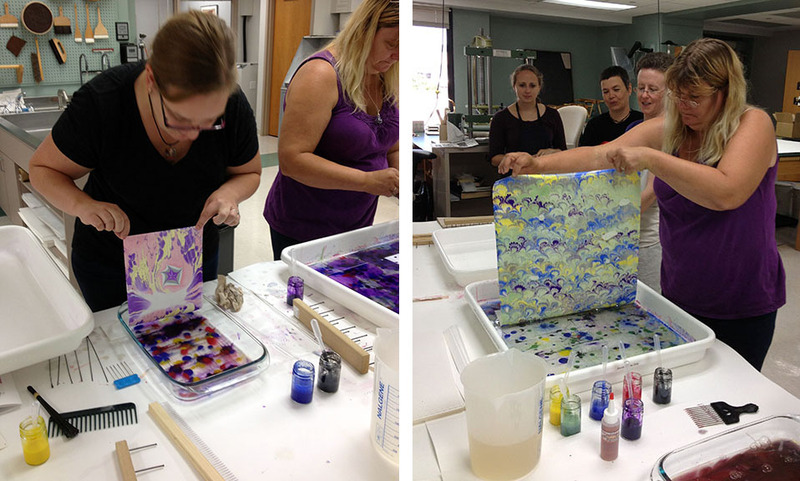 The alum helps the marbling paint stick to the paper. We let the sheets dry, and then pressed them overnight in an oversized book press to mitigate the slight amount of cockling from the alum treatment. 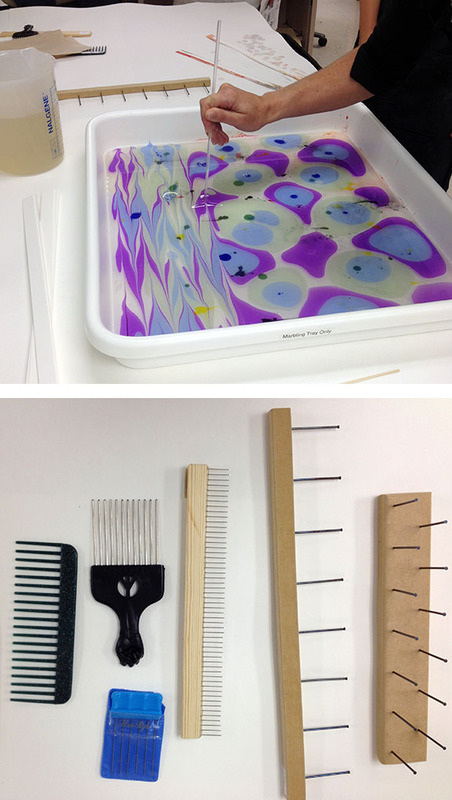 We also mixed up a carageenan sizing solution, which would form the “bath” on top of which the marbling paints would float. Step 1, adding colors to the bath. Clockwise from top left: Susanna; Melissa; Lori and Jim; Martha. The marbling process is simple in theory, but extremely challenging to execute deftly on the first (or second, or third) try. First, each paint color is mixed with a drop or two of gall, which acts as a surfactant, helping to spread the color out on the surface of the carageenan bath. The colors are added drop by drop to the bath, then “stirred” by dragging an acrylic dowel back and forth in evenly spaced lines through the entire bath. 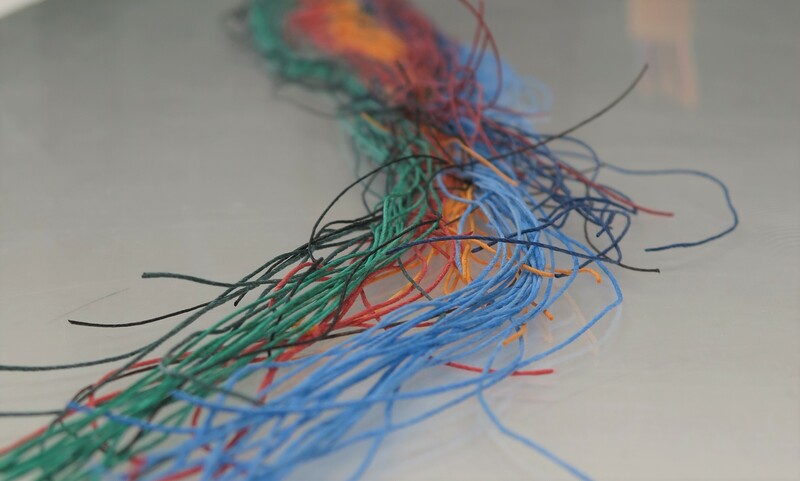 Once the colors have been stirred, a variety of combs and rakes can be dragged through the paint in straight lines, wave patterns, or figure-eights, resulting in an amazing complexity of patterns. When the pattern is ready, a sheet of paper is gently floated on the surface of the bath (alum-treated side touching the bath). Step 3, laying down the paper and then lifting it out of the bath. The paper is then carefully lifted, placed in a second tray, and rinsed with cool water to remove the excess sizing before being laid out on a rack or hung to dry. 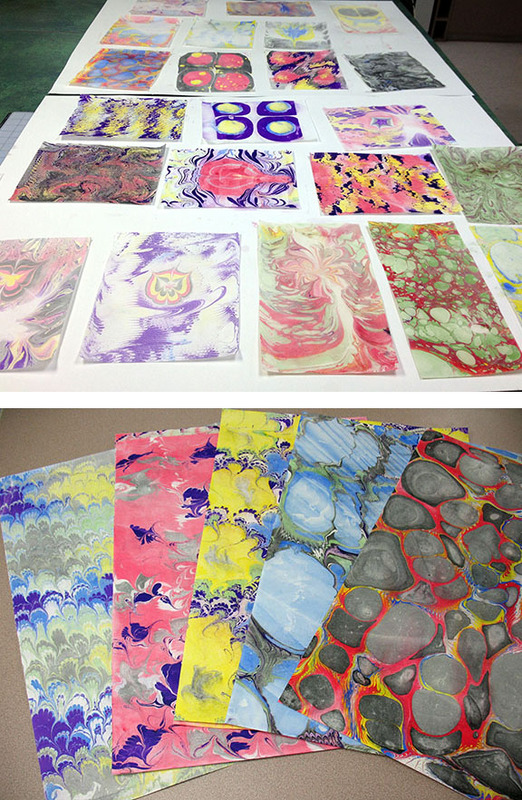 We had a great time experimenting with color and patterns, but perhaps the most significant lesson we learned was how much practice and skill it takes to master traditional paper marbling! This month, the 1091 Project takes a quick peek at one aspect of departmental culture in the conservation labs of Iowa State University Library and Duke University Libraries. To celebrate the end of each Fall semester, ISU Preservation Department holds a “staff development day.” The staff vote on a type of project or handskill to work on during the day-long workshop, we gather our resources, and then have at it. This year, we decided to take our theme from the discussion/debate arising from a recent blog post, and settled on upcycling discarded paper-based materials such as books, dust-jackets, magazines, and maps. Preservation Assistant Mindy McCoy created this Pinterest board full of project ideas to inspire and instruct us. Lori, from Digital Initiatives, meticulously cut strips from pages of children’s books which she will later fold, chain together, and weave into a basket. One popular project several of us tried was building a gift topper bow out of strips of paper secured with double-sided tape. Pictured here are bows made from dust-jackets from architecture coffee table books, a map, and pages from a Russian dictionary. Conservation Technician Mindy Moe turned a gift topper bow into an ornament with a button, ribbon, hot glue, and a little ingenuity. Our conservation volunteer Martha went big! She rolled maps into a sunburst around a decorative mirror. Jim, from Preservation Services, turned a book about fish into a 3D sculpture. 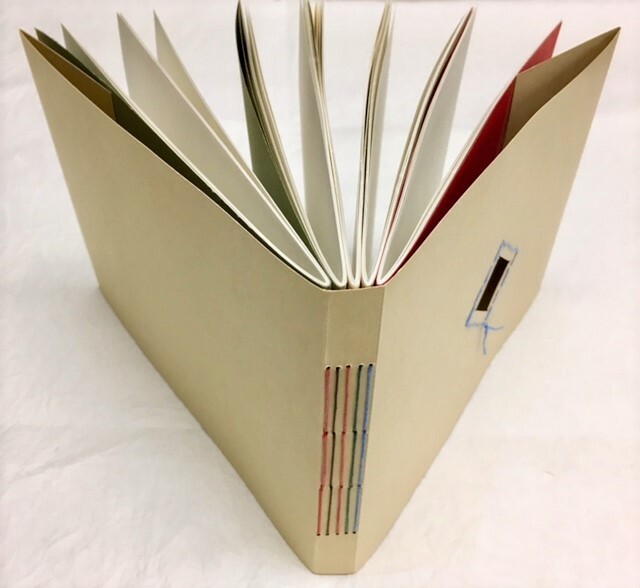 Jim also created this tribute to his friend’s dog Floyd, who has since moved on to that great dog kennel in the sky, but not before chewing up this case binding. Now let’s see how they’re observing the end of the semester and the approach of the winter holidays over at Preservation Underground!